Gold: the one word that caused immigrants to pack their bags and move to California. "You might ask why I go at all.... I am in the prime of life, have no family [and] here is a chance for enterprise and it seems right to embrace it," claimed physician Francis Clark written in a letter to his aunt. He was not the only one; opportunity is the word on everybody’s lips about that new territory called California. Miners who did end up going to California did not see this as greedy, but as the American Dream: going out, finding a good honest job, working hard, and making life better for the family. Many miners made more money in California then other workers occupying different jobs. In the words of physician Henry Richardson, the money "surpasses all expectation...men are washing twenty dollars [worth of gold] per day per man with ease and some have washed even one hundred fifty dollars in one day." In that era, men usually made less than a hundred dollars a month. Not only was this great for workers, it’s great for California as well. Settlers rushed to California when they found out there is gold there. California was not settled before the gold rush. But later, the population in California boomed, which helped the region in many ways. It helped the development of urbanization in meek towns like Sacramento and San Francisco. During the gold rush these mini towns turned into industrialized cities. The cities helped industry, education and trade. Not only was there a population boom, there was an agricultural boom as well. Food shortages were popular in California before 1848. However, by 1852, there were about 12,000 farmers in California. The Gold Rush also helped California achieve statehood in 1850. Belonging to the United States meant a stable government and military protection. California’s statehood helped people pursue the transcontinental railroad linking America's east and west coasts. 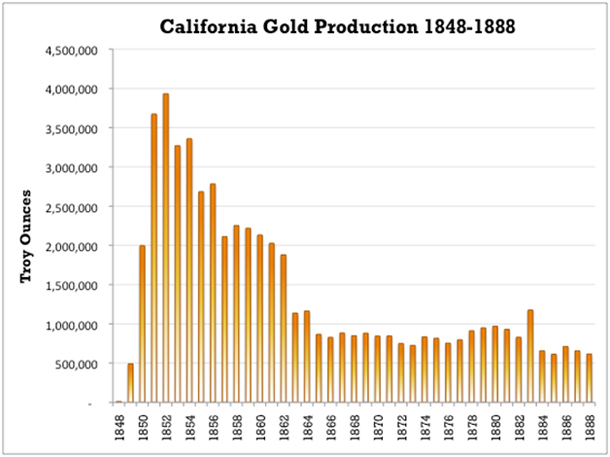 The gold rush was great to California and even benefited the United States as a whole. If it had not have been for the California Gold Rush, the USA would not have changed in many good ways. 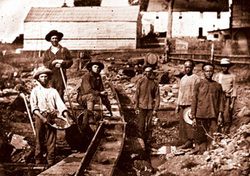 The gold rush helped the U.S. federal government. Since the United States spent so much money on the Mexican War, the Gold Rush helped bring back money into the treasury. "I have no hesitation in saying there is more gold in the country drained by the Sacramento and San Joaquin rivers than will pay the cost of the war with Mexico a hundred times over." Mason, an investigator of the river wrote this in a letter to Washington. The money from the gold rush helped finance the Civil War. While the war was going on, California gold reached about $130 million. The money also helped the economy in Europe, Asia, and China. Because America starting trading more with these countries.